When Chet, a local coach, agrees to help Lula with her new teaching responsibilities, she'll learn more than she ever expected about life and love. I really enjoy books set in the late 1800's, early 1900's. I can picture in my mind the scenes and fashions of 'Meet Me in St. Louis,' and Anne writes this time period well. The early history of basketball, though not something I'm particularly interested in, was still very interesting! Definitely a fresh and unique subject, that's for sure! Anne is also very good at portraying people's emotions, and Playing By Heart had many heart-tugging moments. 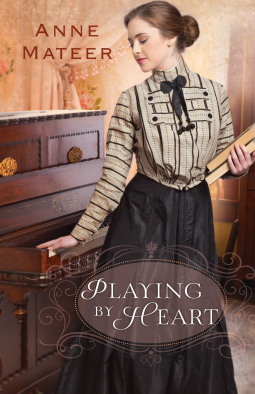 Playing by Heart is written in a style that I rarely enjoy and usually only tolerate: two main characters, both in the first person, alternating point of view every other chapter. After the first few chapters, I was able to focus and get in 'the groove' of the style. The two main characters are male and female, so that helped in keeping them straight as well. I did find that the story seemed a bit choppy, though. It may have been that the kindle version I read wasn't formatted quite properly, but some of the transitions seemed awkward – big gaps of time or changes in places from paragraph to paragraph. Overall, I liked the story of Lula and Chet. Their struggles of family responsibility and duty versus personal ambitions and desires were easy to relate to and evoked a few sniffles from me. Another good historical by Anne – though I think her very first is her best (well, it's the one I've enjoyed the most! ): Wings of a Dream (only 4.99 for your Kindle)! Thank you to Anne and Bethany House through NetGalley for sending me a copy to read and review!